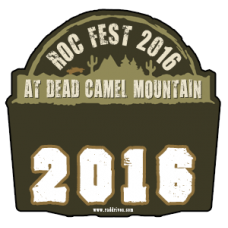 ROC Fest is a family friendly event centered on showcasing setups and being able to see them in action and ask questions of vendors. *Therefore, we will have vendors in attendance showing off their products in a real world environment and allowing you to ask any questions you might have. Those vendors with vehicles will be able to give demo rides and show off their setups, products, and gear. As stated above, this is a BLM permitted event. This is not a competition or race, but a festival/jamboree to make an annual event for the off-roaders of Northern California and Nevada. *This is a festival to share the enjoyment that is off-roading, to hang out with friends, meet loads of new ones and most importantly close down the desert off-road season in an epic fashion! $120 per vehicle. *Fee covers 1 T-Shirts, Two Raffle Tickets, Decals with your number of choice, needed permits, insurance, and PayPal fees. HOTEL - Discount rooms have been arranged at Comfort Inn Fallon for $85.00/$89.00 a night depending on room. (Tax/fees Inc), which can be booked by calling 775-423-5554 under the ROC group. 10% off if we book 5 or more trailers. If you would like a rental, please email your name and the type of trailer you wish to book. Example #4 - Name - Phone. Some floor plans have limited numbers so sooner you book the better. Rental is from Friday to Monday. Camping / Trailers - BLM approved campsite and there is no cost. You are responsible for packing out everything you bring in and making sure we return the area back to how it was when we got there, if not better. AKA pick up after yourself. There are no hook ups or services at the camping area. I will post mid week if I have another trailer rental location. Working on another location to get a better rate. Q: Are there any vendors? Q. Are dirt bikes, ATV and UTV allowed? A. Yes - any and all off road toys allowed. All the trails make fun loops and the big loop last year had a UTV and dirt bike in the mix. Q. Do I have to make the whole event? A. No you can come for only 1 or 2 days. Q. Is there events all day? A. Yes there are planned day and night runs ranging from a few hours so people can come back and hang out or go back out for more trails. Friendly reminder to make sure to sign up soon.